We start picking our first blueberries of the season in July and keep picking until September. With several different varieties which all ripen at slightly different times, we can pick throughout the summer. 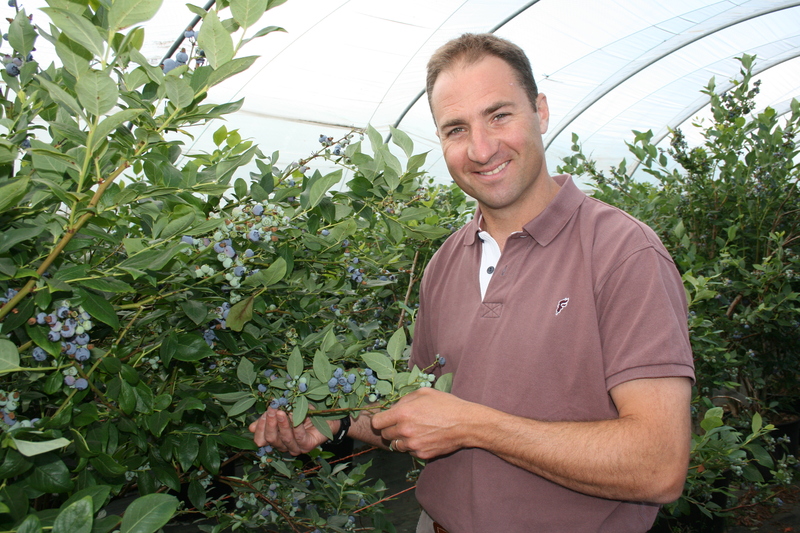 Every single blueberry is selected for quality and ripeness and carefully picked by hand. After picking we bring the berries back from the field and chill them within two hours of picking, this keeps the berries at their best. This year we will produce over 1,000 tonnes which is over 80 million blueberries. As British blueberries aren’t here all year it’s great to make the most of them while you can. To eat local for longer, freeze your British blueberries on a baking tray and keep them in a punnet to enjoy well into October. Our blueberries are of course great as a snack, added to fruit salads or on top of cereals for a healthy breakfast, but best of all, they are also fantastic for baking. Here’s one of my favourite recipes, a lovely way to while away an afternoon. Just pour out the tea and enjoy. Light and fruity, and served simply split open with the tastiest, freshest jam spooned generously on top, these scones are as close to heaven on a plate as you can get. For a special treat a spoonful of thick cream makes them extra luscious. The buttermilk can be replaced with ordinary milk plus a squeeze of lemon juice or 1 tsp cider vinegar to sour it. First make the blueberry jam. Place the blueberries, sugar, zest and juice of the orange in a large heavy-bottom pan. Allow the sugar to dissolve over a medium heat, then increase the heat and allow to boil for approximately 20 minutes, stirring occasionally to prevent it catching on the bottom of the pan. Allow to cool a little then spoon into sterilised jars. Cover with a lid when completely cooled and store in the fridge for up to 2 weeks. 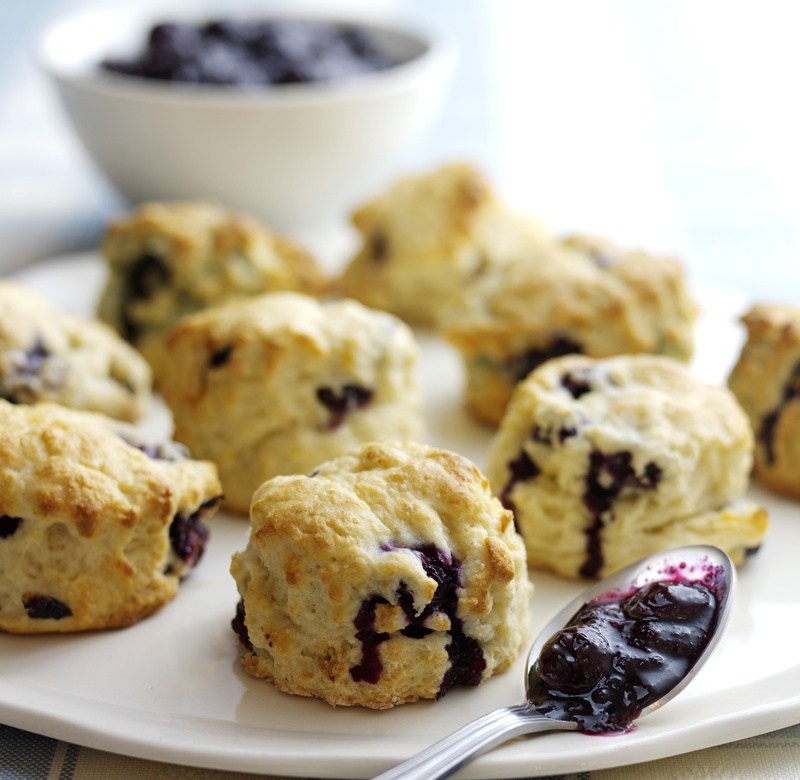 To make the scones, preheat oven to 220˚C/Fan 200˚C/Gas 6. Wash and pat dry the blueberries, dust in a little flour. Set aside. Sift the flour and bicarbonate of soda into a large bowl. Rub in the butter using your fingertips until the mixture resembles fine breadcrumbs. Stir in the caster sugar, orange zest and blueberries. Then make a well in the centre and pour in the buttermilk and milk. Mix together with a knife until you have a soft dough. Turn out onto a lightly floured surface and knead very lightly, then pat and shape into a round 4cm thick. Cut out scones using a 5cm fluted cutter, and place them on a lightly greased baking tray. Brush the tops with a little milk. Bake for 10-12 minutes until risen and golden, then leave to cool on a wire rack. Serve split in half topped with the blueberry jam. This entry was posted in Guest posts, Talking Ocado and tagged best of British, Blueberries, blueberry jam, British, British farms, British produce, eat local, family business, Hall Hunter Partnership, recipe, scones, soft fruit by Ocado. Bookmark the permalink. Am really thinking of farming some of this on my farm.